"To die with a bullet in the chest is better than the slow agony of an old man ..."
wrote the 18-year-old poet, who entered the school of guard ensigns and cadets in St. Petersburg. Further in a letter to M. Lopukhin Lermontov explains that so far he lived only for a literary career - "so many sacrifices brought his ungrateful idol ..."
And now he is a military man. Although everything could have developed in a different way. June 6, 1832 Lermontov filed a petition for dismissal from Moscow University and sent to St. Petersburg. He is going to study at the University of St. Petersburg. But fate decreed otherwise. In Moscow, the poet had already disaccustomed two years, so he wanted to continue the teaching. Unfortunately, he did not get these years and was offered to enter the first year. This seemed probably unnecessary or impossible. A close friend of Lermontov Stolypin (Mongo) advised to enter the school of cavalry cadets and guards sub-lieutenants. November 4, the poet holds the exam. And on November 14, he was already enlisted as a volunteer non-commissioned officer in the Life Guards Hussar Regiment. (At the Blue Bridge in a house once owned by Chernyshev, then rebuilt for Grand Duchess Maria Nikolaevna). It is interesting that practically at the same time the school of ensigns was joined by N.S. Martynov, the one with whom in a deadly duel the poet will come together later. Martynov left biographical notes in which Lermontov of this time is characterized as a man "so superior to his mental development of all other comrades that it is impossible to make parallels between them." My grandmother rented an apartment not far away, on the Moika in the house of Panskov, and determined her grandson for half board. In school Lermontov had differences in fencing,horseback riding and dancing. He deserved the reputation of a desperate, firm and determined young man, which was simply necessary, since it was unbearably shameful to be regarded as a modest man in this school. Once on a dispute, he sat on not heated horse and, as a consequence, 2 weeks of hospital and lifelong limp. Still young Lermontov had at school an interesting nickname - "majushka" (from fr. "May", so the cynical hunchback was called in the novels). Lermontov really was a bit stooped and too witty, so the nickname was appropriate. Two years later, on June 5, 1834, public examinations take place at the school. Then the school leaves for the summer in the camp near Peterhof. On November 22, Lermontov, by the highest order, was promoted from the cadets to the cornets of the Life Guards Regiment and sent to serve in Tsarskoe Selo. However, the poet often happens in St. Petersburg, rotates in high society. In December, at the ball, he first appears in the hussar's uniform. At the same time, his passion for Ekaterina Sushkova begins. The beginning of 1835 is marred by a break with the beloved. Lermontov serves in Tsarskoe Selo, writes poetry, works on the drama "Masquerade" (originally called "Arbenin"), tries to get the censors to print. At the end of the year Lermontov receives leave and leaves for Tarkhany through Moscow. In February 1836, Lermontov returned to the regiment (Tsarskoe Selo). At the same time, he is renting an apartment in St. Petersburg ("... on Sadovaya Street in the house of Prince Shakhovsky for 2000 rubles" - now Sadovaya Street, 61). And at the beginning of 1837 there was another decisive turn in the fate of the Poet. On January 27, 1837, about 5 o'clock in the afternoon on the Black River, Pushkin's duel with Dantes took place. At 6 o'clock in the evening the deadly wounded Pushkin was brought to his apartment on the Moika. According to St. Petersburg, a rumor spread about the death of the poet. January 28 Lermontov wrote 56 poems "The Death of a Poet." On January 29 at 2:45 pm Pushkin passed away. I.I. Panaev wrote: "Poems Lermontov to the death of the poet corresponded in tens of thousands of copies, reread and learned by heart all." On February 7, Lermontov wrote 16 concluding lines of the poem "On the Death of a Poet" ("And You, Arrogant Descendants ..."). And already on February 18 Lermontov was arrested and placed in one of the rooms on the upper floor of the General Staff. In response to a note by the chief of the gendarmes A.Kh. Benckendorff Nicholas I wrote: "... the senior physician of the Guards Corps to visit this gentleman and make sure he is not obsessed with ...". What is the reaction of the authorities to poetry? Lermontov gives an official explanation about the poetry for Pushkin's death. Under arrest, Lermontov was allowed only a valet. The poet ordered the bread to be wrapped in gray paper and, with the help of wine, stove and matches, "wrote several plays" (poems - "When the Yellow Field Fires," "The Prisoner", "Desire", etc. ), since the ink to the "insane" poet it was forbidden to give. On February 25, the highest command comes out: "The Life Guards of the Hussar Regiment, Lermontov's cornet, for writing the poems known to your Excellency (Benckendorff), to transfer the same rank to the Nizhny Novgorod Dragoon Regiment." March 19 Lermontov leaves Petersburg and through Moscow is sent to exile to the Caucasus. On December 21, Nikolay I visited Novocherkassk. At dinner, a conversation was held about Lermontov, and the poet was forgiven. However, the royal favor to Lermontov was "conditional." Being in the Caucasus, the poet was presented several times to military awards, but the highest decision these awards passed by the hero. This was in the first Caucasian campaign Lermontov, and the second. At the end of January, Lermontov returned to St. Petersburg ("the first days passed in continuous running: presentations, mandatory visits, almost every day went to the theater") However, after two weeks he left it, heading for the Grodno Hussar Regiment. Grandmother asks Benckendorff to transfer the grandson to the Life Guards Hussar Regiment. And in April 1838 Lermontov returned to St. Petersburg. At the same time, the famous "Song about the merchant Kalashnikov" is published. N. Bestuzhev wrote to his brother: "Recently we read in the supplement to the Invalid Tale of the merchant's son Kalashnikov. This is an excellent little poem. This is how Walter Scott should imitate, that's how the nation and its history should be transmitted! If you know this ... in, tell us a literary secret. We also ask you to say: who and what Lermontov wrote "The Battle of Borodino?" At the end of August Lermontov get acquainted with the family of Karamzins and almost all year they have them. In fact, because of a trifle (he was on a parade with a too short saber) Lermontov briefly turns up at the guardhouse in Tsarskoye Selo. However, he leads a bright and secular life, it happens at Karamzin, Repnin, Valuyev, at balls in Pavlovsk and Tsarskoe Selo. In a letter to M. Lopukhina, she talks about her successes in the big world, but notes that nowhere is there anything so vulgar and ridiculous as there. A curious episode is this: somehow Lermontov, at the request of Sophia Nikolayevna Karamzina, wrote to her album poems, which she called weak. The poet immediately ripped the page with poems. However, the quarrel did not last long and in a few days they reconciled. In 1839, Lermontov became a member of the circle of 16 - a meeting of brilliant youth in Petersburg. "After visiting the theater, they would gather from one or the other, they would conduct free conversations, without fear of the 3rd division". Lermontov is familiar with Zhukovsky, Vyazemsky, Belinsky, VF. Odoyevsky, Baratynsky - he is among the elected people of Russian literature. In December, at a ball at Hohenlohe, Württemberg's envoy, the first secretary of the French embassy turned to A. Turgenev, is it true that Lermontov in a famous poem to Pushkin's death scolds all the French or only a murderer. A. Turgenev asks Lermontov for poetry, which he gladly gives. A few days later the incident was settled, and Lermontov was invited to the ball to the French envoy Barant. In December, the poet receives the rank of lieutenant. 1840 - Lermontov's last year in St. Petersburg, or rather, not even a year, but only winter and the beginning of spring. All decided a duel with the son of the French envoy E. de Barant. After the duel, Lermontov was imprisoned in Ordinance House, where he was visited by Belinsky. "Furious Bessarion" after he wrote about the meeting: "... Recently I was in prison with him and for the first time I started talking with him from the bottom of my heart. Deep and mighty spirit. How true he looks at art, what a deep and purely immediate taste of the elegant! Oh, it will be a Russian poet from Ivan the Great! Wonderful nature. " Soon Lermontov was transferred to the Arsenal guardhouse. However, the king reacted to the duel more condescendingly than the Grand Duke Mikhail Pavlovich, who demanded to keep the poet in the fortress in the casemate of the month three, and only then "... to write to one of the army regiments with the same rank ...". 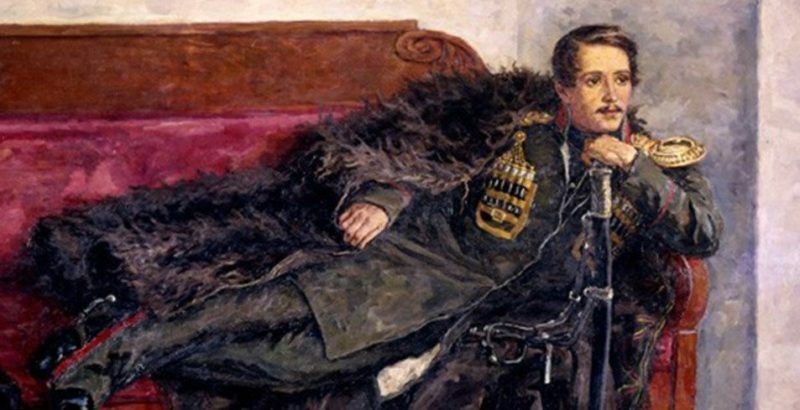 Nicholas I decided to limit himself to "transferring Lermontov to the Tenginsky Regiment." It is interesting that this year Lermontov was going to retire and return to his "ungrateful idol" - literature. But my grandmother wanted to see her grandson as a military man with ranks, and the poet did not dare contradict her. In early May, Lermontov left Petersburg forever. Before leaving the house Karamzin farewell party. Further was a heavy military service, the heroic deeds of lieutenant Lermontov and poems of the romantic poet of Russian literature.